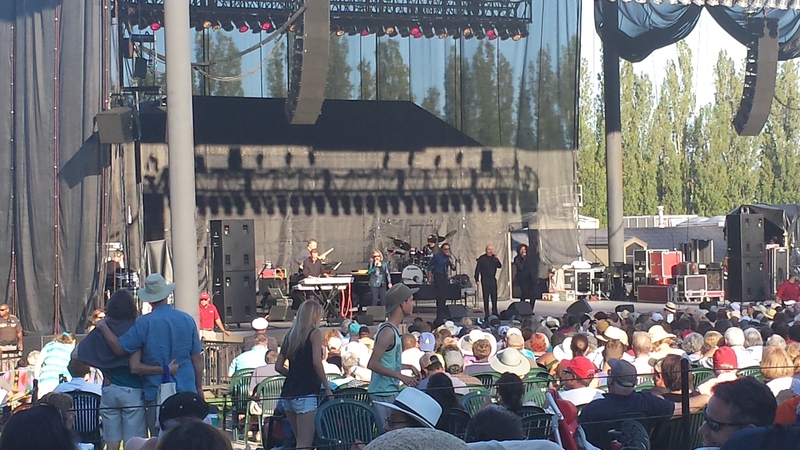 We went with some of my wife’s cousins and family to the Smooth Jazz festival last Saturday. It was an amazing day, but a bit on the unusual side. It all started well, with a decent place in line, perfect weather and a strong line-up ahead: an up and coming jazz talent, Lee Ritenour with special guest Dave Grusin (can you believe he’s 80!?) , Spyro Gyra and to cap it off, Manhattan Transfer! Chateau Ste. Michelle wine is in a league of its own and we had plenty to choose from. Started with Chardonnay, moved to Cabernet. Life was good. Temperatures eventually were in the 80s and everyone there was just basking in the sunshine. We had brought snacks, but managed to sneak in some food from a couple of the booths, including chicken shish-kabob and blackened salmon Caesar salad. Of the acts that performed, Lee and Dave stole the show. They easily could have played the entire afternoon and they left to a standing ovation. Check out Dave Grusin on Wikipedia and you’ll be amazed how many songs he’s done that you’re familiar with. The biggest disappointment: Manhattan Transfer. In their defense, they had mixing problems. The smooth blend we hear on the studio songs just wasn’t there. Now, here’s where it gets weird—people started leaving. I don’t mean a few, I mean in droves. That would include us. The bulk of our group was done with them and we decided to go with the crowd. Had we stayed, it would have been to tough it out, but after being there 10 hours already, we decided it was just time to go. The biggest learning curve for me was making sure we have clip-on umbrella’s for the chairs on the next hot day concert we attend. They ask you to take them down during the music, but with this day a steady 80-degrees, it would have been great to have them.